Remember how I said I had like 17 stories from New Jersey and I would probably forget to tell you 14 of them? Well, this is one of the fourteen, and at this point, I'm going to tell this story very poorly. 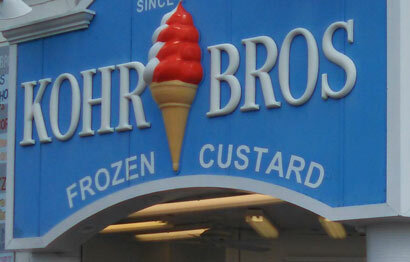 This is Kohr Bros Frozen Custard, not to be confused with Kohr's Frozen Custard. Yes, they are related, but one has like 7 stores and the other has like 70. We'll, maybe not that many, but let's focus on the bigger chain shall we? They've been all over the Wildwood and New Jersey boardwalks since I was a kid so it was nice to see them still around. The fun thing about this brand is that rather than picking between vanilla, chocolate, or both, you get a whole slew of choices to mix and match.... or do you? While they have a decent assortment of vanilla & chocolate, mint & chocolate, coffee & caramel, orange sherbet & vanilla, peanut butter & chocolate, and strawberry & banana, you can't just willy nilly mix any two choices together. I can't make an awesome strawberry and chocolate cone, or make a mocha cone (coffee and chocolate). I can't do a mellow mint and vanilla mix. I can't do anything out of the predefined space. Yes, I've got 15 options, but I want 50! 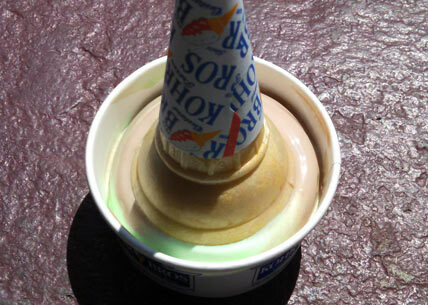 You know what happens to soft serve (frozen custard) when it's 95 degrees and sunny? Yeah, it pretty much melts instantly. I couldn't even take a picture because of how quickly it melted. My wife and daughter also had Kohr late one night and things were fine when it was cooler, but when it's crazy hot and sunny, yeah, you need to fine shade immediately. I'm just glad my daughter asked for a cup and got an extra one, because otherwise I would have been wearing this. Sorry, I'm just randomly complaining. This was part of the last few hours we spent on our vacation and I was just burnt (mentally, not literally, I remembered sunblock for the most part). I was tired, I was frustrated, and I tend to lose my appetite when it gets that hot. I just wanted away from the humidity (which ironically didnt really break until this past weekend). I'm not saying that it was a bad product, I just wasn't in the mood for it. I wasn't in the mood for it to melt, I wasn't in the mood for mint, and I just wanted to be home in my bed, resting my weary joints. Ok, yeah, sorry, no idea why I'm rambling. I was supposed to post Nick's review today but there are a ton of pictures and I just don't have the time or energy to crop them now... so you get my rambling. Let's end it this way: On a hot day, soft serve or hard ice cream? Let us know in the comments. Do you have fond memories of Kohr bros? Or maybe another place? Have you ever seen that machine that offers like 24 flavors of softserve? Should I have picked a different flavor combo? I think I would have been ok if I could have made a strawberry and chocolate twist, and maybe at some of their other locations you can do that, but at this location that was right by where we parked, my options were limited. Grew up going to Wildwood Crest. Always remember that sign. Good eats. I adore a good ice cream cone, but lately I feel like the hot temperatures are making it impossible to enjoy my favorite treat. It's hard to savor and linger over ice cream when you feel like you have to gulp it down before it melts all over your hands and clothes. So I guess I've been opting for more hurricane or blizzard style treats lately that comes in a cup. Hard ice cream doesn't seem to do much better for me honestly. I was at a Ben and Jerry's scoop shop and Baskin Robbins. Both had ice cream so soft that it instantly melted as well. The perils of summer! As for sampling more flavors, you could try a half and half. Like half mint/chocolate and then half strawberry/vanilla. You could fill your cup/cone with one mixture halfway then go the other half with the other mixture? Four flavors then.